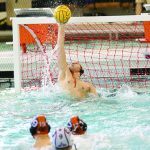 The weekend tournaments continued for Rockford Men’s Water Polo on 8/24-25/18 with the Varsity at Jenison High School coming in with an 8-0 record so far this year. On Friday night, 8/24 Rockford started in the pool facing Grand Haven. The Rams started out strong out scoring Grand Haven 8-1 in the first period. That gave coach John Haga a chance to give his starters some rest and get a number of other players in the pool. Leading the scoring was Junior Co-captain, Elijah Chino with 5 goals, four of which came in the first period. Kyle Dedert scored 3 goals, Kyle Arend had 2 goals and Zach Burns added 1 goal. Leading the defense was Brenden Saur and Zach Burns with 2 steals each. Elijah Chino, Kyle Dedert, Nate Cheney, Bodie Mitchell, and Nate Hopkins each had 1 steal. Leading the team in Assists was Brendan Saur with 3. The game ended with Rockford winning 11-4. Game two that evening had Rockford facing would should be its toughest competition on this side of the state, Hudsonville. The game was close the entire time but in the end, Hudsonville’s pressing defense resulted in 16 turnovers by the Rams and handed Rockford its first loss of the season, 6-5. Leading the scoring for the Rams was Senior Co-Captain, Zach Burns with two goals. Kyle Arend, Elijah Chino and Gavin Saur each added 1 goal. Rockford played solid defense, resulting in 14 turnovers by Hudsonville. Leading the team in steals was Senior Co-Captain, Kyle Arend. Gavin Saur and Kyle Dedert each had 3 steals. Elijah Chino had 2 steals and Nate Cheney and Zach burns had 1 steal each. Junior Co-captain Ben Schuchardt kept the Rams in the game the whole time with 10 saves. After having Labor Day weekend off, Rockford men’s polo was back in the pool on 9/7-8/18 at the Shootout at the shore in Grand Haven. Friday night started with Rockford with a decisive win over Zeeland 11-4. Leading the scoring was three of the co-captains, Gavin Saur, Zach Burns and Elijah Chino with 3 goals each. Sophomores Cade Dorer and Nolan Graalman each added 1 goal. Rockford again played solid defense, creating 14 turnovers. Leading the defense with 3 steals each was Kyle Arend and Brendan Saur. Nick Deugaw and Zach Burns had 2 steals each. Elijah Chino, Gavin Saur, Nate Hopkins and Matthew Weber each had 1 steal. In game two, Rockford took on arguably the best team on the east side of the state, Okemos. 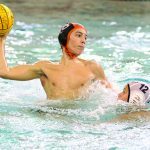 With a third string goalie in for the Chiefs, Rockford had no trouble defeating Okemos, 13-4. Elijah Chino led all scorers with 4 goals. Zach Burns had 3 goals. Kyle Arend and Gavin Saur had 2 goals each. Juniors Kyle Dedert and Brendan Chaudoir each added 1 goal. Gavin Saur and Zach Burns lead the defense with 4 and 3 steals respectfully. Chino, Dedert, Cheney, Deugaw, and Weber each added 1 steal. Brendan Saur and Elijah Chino lead the team in assists with 3 each. Goalie Ben Schuchardt had 10 saves in the victory. Saturday had Rockford with 2 more games on the schedule. In game one, the Rams easily defeated Grand Blanc, 14-1. In game two, Rockford once again faced Hudsonville. With some stellar play by the Hudsonville goalie and a number of shots that bounced off the top or side of the goal, Rockford was only able to score 3 times on 24 attempts, losing the game 11-3. Leading the scoring for the Rams was Kyle Arend with 2 goals and Elijah with 1 goal. Gavin Saur had a good defensive game, leading the defense with 6 steals. Kyle Arend had 2 steals while Trey Williams, Elijah Chino, Kyle Dedert, and Brendan Saur each added 1 steal. The regular conference season kicks off for Rockford Men’s Polo on September 10th with an away game at Grand Haven. Good luck rams in your quest for a 26th straight district title and third straight division 1 state title.